Judged on the results he achieved at the end of 2010, it looked as if 25 year old Texan Caleb Fairly was headed straight for the top. Riding for Holowesko Partners/Felt, the Garmin U23 ‘feeder’ team, at the start of the year, Fairly won the Tour of the Bahamas, the Tour of the Battenkill and then rode a strong Tour de Beauce. Moving up to the Garmin Pro Tour team as a stagiaire towards the end of the 2010 season, his debut was straight from the top drawer. He took 12th in his first race, the Memorial Pantani and followed that up with third in the Giro della Toscana. It was expected that Fairly would join Garmin for 2011, but the Garmin/Cervelo merger complicated things and he went to HTC. 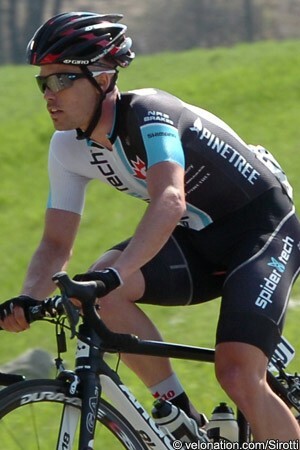 With HTC folding at the end of the season, he then moved to Canadian Pro Continental squad SpiderTech for 2012. 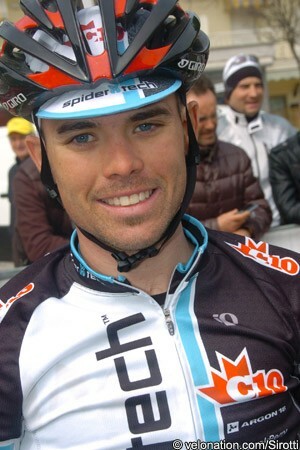 But for 2013 Fairly has made the move which most expected him to make two years ago and is back with Jonathan Vaughters. He took time to talk to VeloNation as he prepared to go back to the WorldTour. VeloNation: We thought 2011 would be ‘mega’ for you, Caleb? Caleb Fairly: Yes, 2010 was fun. 2011 was a difficult start to my pro career but I’m not one for excuses. HTC turned out not to be the ideal situation for me, but there have been many good aspects of the last two years and I am a better rider and person for the road I’ve taken. VN: Why did you go to HTC and not Garmin in 2011? CF: In a word, I was impatient. Garmin and Cervelo merged in 2011 and JV had too many riders. I didn’t appreciate it at the time, but JV made me a three year offer to stay on the development team in 2011 before joining the Pro Team in 2012. But I got a little impatient. I’d had a successful stagiaire ride in 2010 and felt I was ready. So when Bob and Rolf Aldag offered me a job, I jumped at it. It was a mistake - I didn’t appreciate how comfortable I was at Garmin and what a great atmosphere there is there. VN: Were you happy with your year at HTC, and what was the highlight? CF: HTC obviously didn’t work out how I hoped - I think it’s best to leave it at that. I’m still appreciative of the opportunity I was given there and I have a lot of respect for Rolf and Alan and others that were there. It was just a tough year for the whole team. They had a small roster (26 riders) so we were spread a bit thin which resulted in me having a schedule that was probably a bit much for me at the time. They also had the distraction of dealing with the uncertainty of their future, so there were some challenges to deal with. Still, there were good times. I learned a lot about being a pro and I raced almost 80 days which was great for my development. The highlight was probably helping Tony Martin win the Tour of China. It was the end of a long year and I was able to do my job for Tony. It was a good way to finish my time there. VN: It must have been a shock when the team folded. Was there adequate warning? CF: There is never adequate warning when a team folds. It is part of the current state of the sport where riders are so underrepresented, both individually and as a group. I had a two year contract that was basically worthless. Every time I see a team fold I will always feel for all the riders because I know it’s tough. Two days before it was announced, the riders were all assured we had sponsors and were going forward. Then we got an email a couple hours before it hit the press that HTC was folding. For a neo, it was a tough time. I was unexpectedly looking for a job at a time when there were two less teams in existence and 20 great riders also looking for a new job. But again, I learned a lot of good lessons and I am grateful for Rolf’s support in helping me (and everyone else) find a place for 2012. 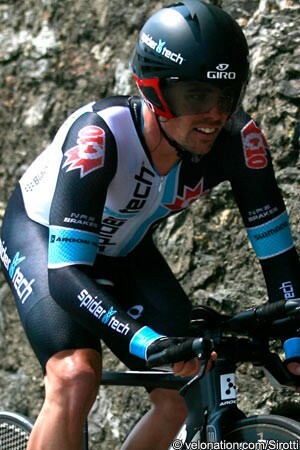 VN: How was your year with SpiderTech – what was the highlight? CF: SpiderTech was a good experience. Steve Bauer and Kevin Field are great guys and I will always be thankful for them taking me on. It was run on a very small budget, but Steve made sure we got high-level racing opportunities, which is why I chose it over the other offers I had. I also got to work again with my junior coach, Mike Carter. From a racing perspective, it was a year filled with tough luck. I crashed 12 times in 2012; I eventually ran out of bib shorts because of all the crashes. I was probably pressing too much, but I really wanted to get back to a Pro Team. I’m glad it’s behind me. VN: Did you get much warning of SpiderTech folding? CF: It wasn’t an issue for me because I signed with Garmin before the team folded. But I know Steve did a good job of letting the riders know that he was having issues and keeping them in the loop, and I understand that he and Ray Arbeson stepped up and fulfilled his contractual commitments to the riders. VN: Do you think they will be back in 2014? CF: I hope so - Steve is a great guy and cycling needs more people like him. VN: How did the Garmin deal come about? CF: My agent reached out to JV after Montreal. I flew to Denver and had breakfast with JV one morning to talk about me coming back. We covered a lot of ground, from my leaving two years ago to what kind of rider I am, to the current state of cycling. He only had one spot left and he offered it to me the next day. Needless to say, it wasn’t a hard decision and when I heard a month later that SpiderTech was folding, I was even more thankful. It’s a two year contract and I’m motivated to repay JV’s faith in me. VN: Will you still be based in Girona? CF: Yes. Ally (my wife) has really gotten to feel at home there and it also happens to be Garmin’s European headquarters. VN: Have you met your teammates yet - Is it like ‘coming home’? CF: Yes, and yes. We just finished our first training camp in Tucson. There is definitely a ‘team’ aspect to Garmin that is unique. There are several familiar faces and I got to room with Peter Stetina who I raced with on the U23 team, so there is definitely a ‘coming home’ aspect to it. Overall, the team was super-welcoming. Every night, I went to bed thankful to be back. VN: What does your programme look like? CF: I start off in Mallorca, Haut Var and then Langkawi. VN: What’s your favourite type of race? CF: I love punchy/short, steep climbing races similar to Toscana where I was third as a stagiaire. I would like to compete in some of the hilly classics this spring. I did them all in 2011 and would like to have another crack at them. But I love supporting my teammates. When a team wins, the type of race doesn’t matter. VN: Are you still a devotee of your high-tech training methods? How have your ‘numbers’ progressed? CF: I definitely still use a power meter but I don’t think that’s really considered ‘high-tech’ anymore. I’ve probably moved toward listening to my body a lot more and paying attention to how I feel vs. just looking at the power meter and training files. But the power meter will always be a critical tool for me. I don’t like to blab about my numbers, but they have progressed. I will also race 2013 4-5 kilos lighter than I did in 2011 and 2012. That always helps the numbers. VN: What are you looking for in 2013? CF: I’m looking forward to 2013. It’s a big opportunity for me. I will be a valuable teammate at Garmin, and get back to the rider I was in 2010.